Preheat the oven to 450°. Place the pizza crust on a rimmed baking sheet lined with parchment paper. In a medium skillet, cook the sausage links in the 1 teaspoon of olive oil over moderate heat until browned, about 10 minutes. Drain on a paper towel-lined plate. Using a sharp knife, slice the sausages into 1/2-inch rounds. Sprinkle the cheddar evenly over the pizza crust, leaving a 1/2-inch border. Top with the sausage slices, tomatoes and two thirds of the scallions. Bake for 8 minutes, until the cheese is beginning to melt. Transfer the pizza to a rack. 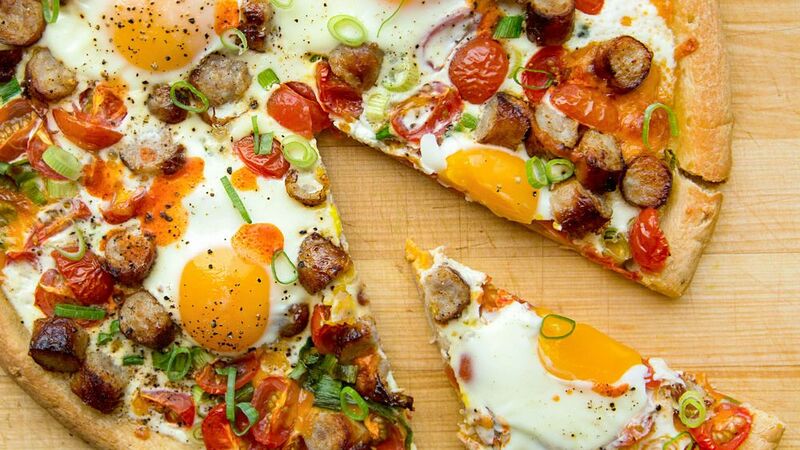 Crack 1 egg into a small bowl, then carefully slide it onto the pizza. Repeat with the remaining 3 eggs. Season the pizza with salt and pepper and bake it for another 10 minutes or so, until the egg whites are set but the yolks are still runny. Transfer the pizza to cutting board. Garnish with the remaining scallions and drizzle with olive oil. Cut into wedges and serve with hot sauce.